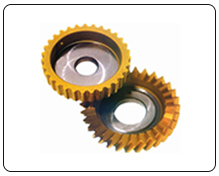 Disk Type Shaper Cutters, Cutting Tools Manufacturers & Exporters in India. - Steelmans HSS Disk Shaper Cutters. These shaper cutters have a disc shaped which have the general utility to give roughing or finish form to cut spur, helical & spline gear.